1. Obtaining accurate and representative demographic metrics for animal populations is critical to many aspects of wildlife monitoring and management. However, at remote animal colonies, metrics derived from sequential counts or other continuous monitoring are often subject to logistical, weather and disturbance challenges. The development of remote camera technologies has assisted monitoring, but limitations in spatial and temporal resolution and sample sizes remain. 2. Here we describe the application of a robotic camera system (Gigapan) which takes a tiled sequence of photographs that are automatically stitched together to form highresolution panoramas. We demonstrate the application of the Gigapan using data collected during field-testing at a shy albatross colony on Albatross Island in northwest Tasmania. 3. We took daily panoramas over five days to estimate mean incubation shift-duration, an indirect measure for foraging trip duration, in an existing study area. Similar numbers of occupied nests could be observed at a distance of ~100m in the Gigapan panoramas compared to ground-based counts (115 and 117 respectively). Of these, birds on 90% of nests visible in the panoramas could be unambiguously identified as marked or unmarked with a small daub of paint throughout the study period and thus a shift change reliably recorded. Gigapan-based shift duration was estimated using a novel instantaneous statistical method and were longer than estimates earlier in the egg brooding period, potentially revealing a new pattern in shift duration. 4. This example field application provides proof-of-concept and demonstration that the relatively low cost Gigapan system provides the spatial advantages of satellite or aerial photos with the detail and temporal replication of land-based camera systems. The Gigapan system can extend or enhance traditional data collection methods, particularly for simultaneous observations, at distance, of the behaviour of many surface nesting colonial seabirds. 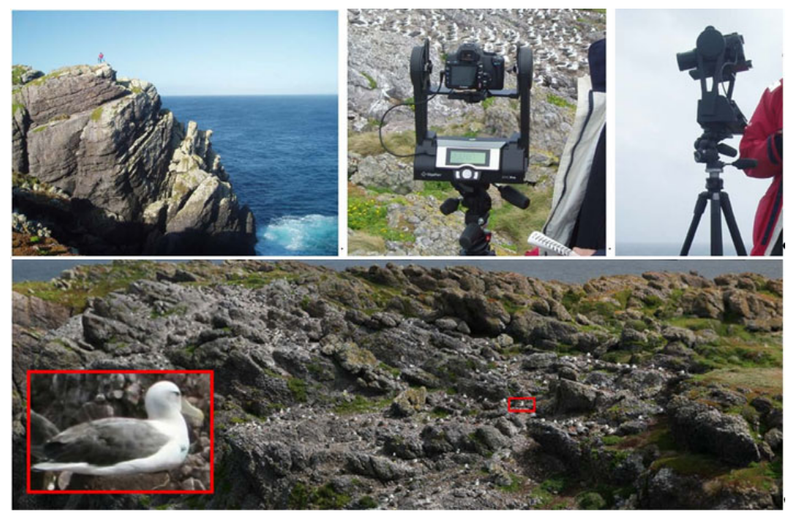 Field based proof-of-concept of a high resolution Gigapan camera system for observing behaviour of surface nesting colonial seabirds. breeding performance and survival (Chambers et al. 2011; Gaston et al. 2014; Wilcox et al. in review). We surveyed nesting birds on Albatross Island, a colony of ~5200 breeding pairs, from 20th September to 9th October 2013. Data collected during this period provided estimates of incubation shift duration from traditional ground-based methods as well as from Gigapan panoramas. As the time period of sampling differed between methods an absolute comparison is not appropriate, but the comparison of different methods is instructive. Concurrent counts of nesting albatross from visual inspection on foot and via camera images were originally planned. Unfortunately these were offset due to rough conditions leading to abandonment of a boat landing by the camera party (TL, AH). The marooned shore party persevered with the work program through extreme weather conditions. The camera team eventually managed to land via helicopter, but with such a short and weather interrupted field season at this very isolated site there was no time to repeat the ground-based counts. Here we have demonstrated the potential for a single camera system to observe approximately 100 nest sites and to provide a robust estimate of one metric of breeding behaviour, incubation shift duration. Even from a considerable distance (~100 m), the images of individual birds in each high resolution panorama were detailed enough to determine the presence or absence of a small blue mark on albatross across 90% of observed nests over this short proof-of-concept study. Location of the Gigapan camera system about 100 meters from the centre of the observed shy albatross colony (upper left). The camera system mounted on a tripod (upper center and right). Gigapan panorama of the colony, with inset illustrating a marked bird on a nest. See this high resolution panorama at http://www.gigapan.com/gigapans/142356.